Winning the lottery jackpot must be one hell of an experience. Not only do you have more money than you could ever spend, but you also get that ridiculously big cheque to show off in the press! One man from Iowa decided that it shouldn’t just be the jackpot winners who had all the fun. 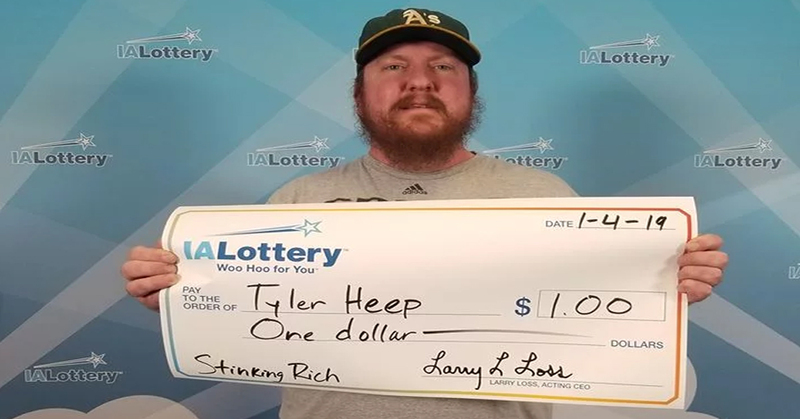 Tyler Heep decided he would celebrate the momentous achievement of winning exactly $1 on a lottery scratch card by getting the lottery company to present him with a giant novelty cheque. 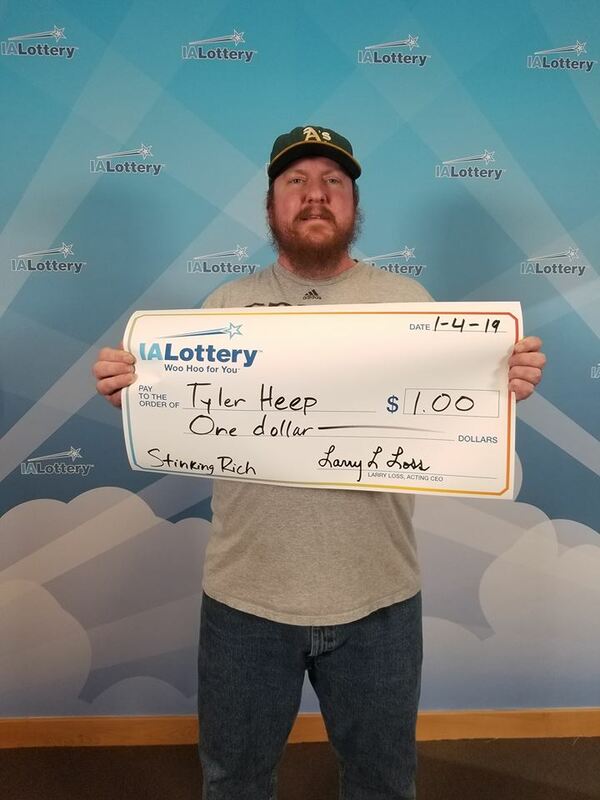 Mr. Heep, from Urbandale, went down to the lottery headquarters in Des Moines to request his winnings be presented to him on a giant cheque, just like all the other jackpot winners. Despite probably spending more than a dollar to actually get there in his car, amazingly, the lottery execs agreed, and presented him with what must be the lowest-value winner’s cheque of all time. “I just went by the state lottery office with a winning scratch off ticket. I told them I’d like one of those big ceremonial checks as payment. “They decided to treat me just like a million dollar winner. 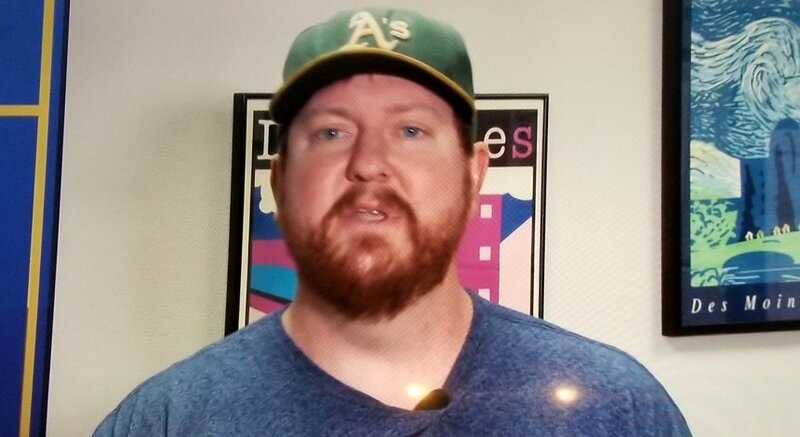 The guy came down the stairs and they took me into the back room where the camera was with the Iowa Lottery logo. In the memo section of the giant cheque, the lottery officials wrote, ‘stinking rich’. To commemorate his big win, Tyler also said he’s getting his giant cheque framed so he can display it on his wall. And why wouldn’t you? Sometimes you need a reminder of the good things in life. Also, I guess it’s better off there than trying to cash it in line at the bank. Good luck with that one!